Manual Cinema, based out of Chicago, creates work that is undefinable in the “it depends on who you ask” kind of way. It is live acting. It is original scores and live musical performances. It is seamless layers of overlapping technology and projection to create live animation. It is cinema. It is puppetry. No matter how you categorize the work, it is ALIVE. 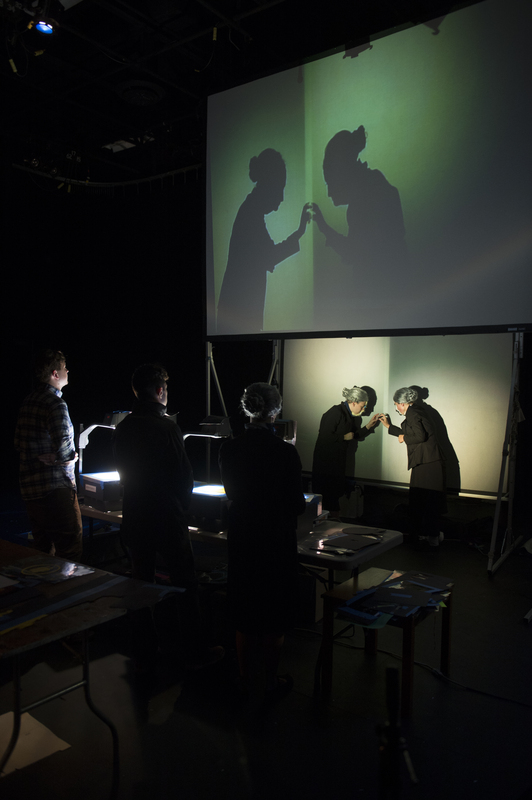 Drawing from the strengths of the company members’ variety of backgrounds, the amalgamated product combines elements of cinema and theater to make the artists’ process as accessible to the audience as possible. In their presentation of Ada | Ava at The 3-Legged Dog, co-produced by The Tank, the company staged four overhead projectors, a rotating cast of actors/puppeteers, three musicians, and two sound board ops. And yet, despite the high visibility of the creators at work, the finished product retained an air of technological magic, even as it unfolded in front of the audience’s eyes. The company invited audience members up on stage to observe their set-up after the show, and graciously answered a slew of questions about their creative process. And yet, even stepping behind the figurative curtain did not diminish the singular creativity of their production. Manual Cinema began producing their work for a storefront theater puppet festival in Chicago. Their first creation was called The Ballad of Lula del Ray, (which later traveled to the NYCFringe Festival in summer 2013). In the first iteration of Lula, their music was cued live, and they had one projector, two puppeteers, and only one color sequence in their film. Since they all enjoyed developing that piece so much, they kept working on new iterations, and eventually established enough of a following to necessitate a virtual presence (check out their website here). Now, the company has six feature-length shows, which all live in repertory. Three are in the style of Ada | Ava: completely original works derived from new narratives created by the company members. These include Lula del Ray and their most recent piece, Mementos Mori, a multi-protagonist story exploring death and the afterlife. It is their biggest show yet, with two screens, each accompanied by its own set of four projectors. The story is set in present-day, and incorporates all our familiar personal technology, including an app for the Grim Reaper, “Lady Death,” who takes souls by swiping left (complete with a “sching!” sound effect). Fornace, meanwhile, live-mixes the projections between the two screens, to create the picture projected onto the larger screen. Mementos Mori premiered at the Museum of Contemporary Art in Chicago as part of their international puppet festival, and will be traveling to the Noorderzon Festival in the Netherlands this August, then Duke University this fall. Other productions include My Soul’s Shadow, based on Federico Garcia Llorca’s poetry, Fjords, an adaptation of poems by Zach Schomberg produced as part of a poetry tour of New York, and Show & Tell, a collaboration with Storycorps. The story behind Ada | Ava began with company member Drew Dir, who was working on a production of The Comedy of Errors at the time, and was struck by the idea of slowing down the pacing of the show, to create a suspense thriller in the style of Hitchcock. At the same time, his grandmother passed away, and he and his family closely observed as his grandfather reoriented his life, after having lived with his wife since the age of 18. Dir thereby concocted a story of two co-habitant elderly sisters, one of whom dies early in the play, prompting the other to grapple with her profound loss. The first version of Ada | Ava appeared in 2011, featuring one projector in a storefront window. By 2012, the show had expanded to two projectors and appeared in its first feature length version. It has since toured around the USA, and the company predicts it will continue touring for a couple more years. While the Ada | Ava story is easily accessible to a wide range of audiences thanks to its visual and sonic emphasis, it is by no means simple. For the astute observer, there are innumerable references to cinema, theater, and literature throughout the show. The company cited Dr. Caligari lighting effects, German expressionistic horror elements (à la Metropolis), the carpet from the hotel in The Shining (as the wallpaper in the sisters’ home), Ray Bradbury’s stories (such as Something Wicked This Way Comes), and shots that reflect Vertigo, to name a few inspirations. In viewing the performance, I was particularly struck by the overlap with Greek mythology, intentional or not, seeing neat parallels to the story of Orpheus and Eurydice as the characters grapple with mortality in a fantastical way. Overall, the story took so many turns through dream and fantasy that it was difficult to determine what was real and what has imagined, and I was more than willing to suspend my disbelief for the emotional investment I had in the sisters’ tender, lifelong relationship. The degree of craftsmanship and storytelling that Manual Cinema demonstrated in Ada | Ava is exemplary, and their blend of theater, puppetry, and cinema is absolutely unique. The appeal is cross-disciplinary, not only for its novelty, but also for the references pertinent to cinephiles, theater goers, and tech geeks. Manual Cinema will return to the USA for their performance at Duke University on September 11, followed by a presentation of Mariko’s Magical Mix: A Dance Adventure with Hubbard Street 2 at the Kennedy Center in Washington, D.C., on October 2. I recommend keeping this group on your radar, to have the personal experience of diving into their world of beautifully tangible storytelling.